Half a mile north was born, 1774, Meriwether Lewis, of the Lewis and Clark Expedition, sent by Jefferson to explore the far west, 1804–1806. The expedition reached the mouth of the Columbia River, November 15, 1805. Location. 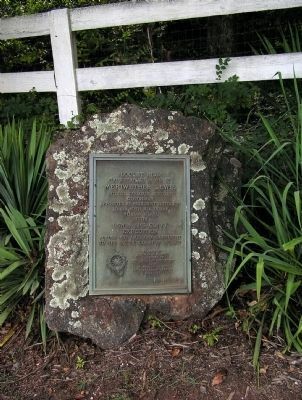 38° 3.435′ N, 78° 35.847′ W. Marker is near Ivy, Virginia, in Albemarle County. 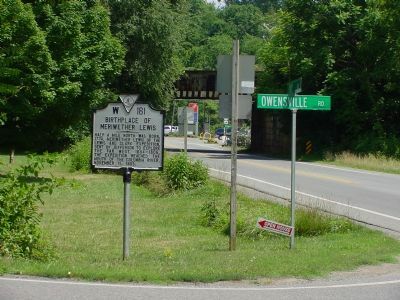 Marker is at the intersection of Ivy Road (U.S. 250) and Owensville Road (County Route 678) on Ivy Road. Touch for map. Marker is in this post office area: Ivy VA 22945, United States of America. Touch for directions. (approx. 4.6 miles away); Convention Army The Barracks (approx. 4.7 miles away); Charlottesville (approx. 4.8 miles away); Technical Sergeant Frank D. Peregory (approx. 5.1 miles away); Edgar Allan Poe (approx. 5.2 miles away). Located on Owensville Road, in front of the site of Locust Hill. More. 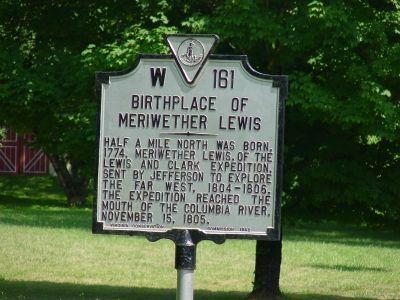 Search the internet for Birthplace of Meriwether Lewis. Credits. This page was last revised on June 16, 2016. This page originally submitted on July 21, 2007, by J. J. Prats of Powell, Ohio. This page has been viewed 8,282 times since then and 97 times this year. Photos: 1, 2. submitted on July 21, 2007, by J. J. Prats of Powell, Ohio. 3. submitted on September 5, 2009, by PaulwC3 of Northern, Virginia.